Banjo music brings out the smiles, and this banjo Christmas ornament will bring to mind all the fun times enjoyed listening to the bright, whimsical melodies this instrument produces. 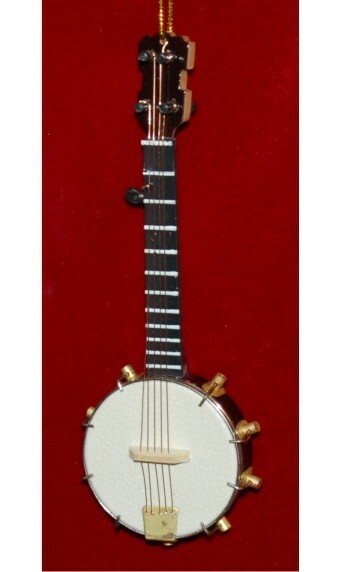 Banjo players will be astonished at the authentic detail depicted in this four-stringed ornament that is crafted by hand from quality materials you can expect to look great for decades. Form a group with this banjo personalized Christmas ornament by adding an acoustic guitar, drum set and other musical instrument ornaments from Russell Rhodes. The gift-quality velvet storage bag we send it in is a great way to store your replica banjo ornament too. For a Banjo Player Friend Oct 29, 2014 Adelaide J. Gift Dec 27, 2013 Carol H.